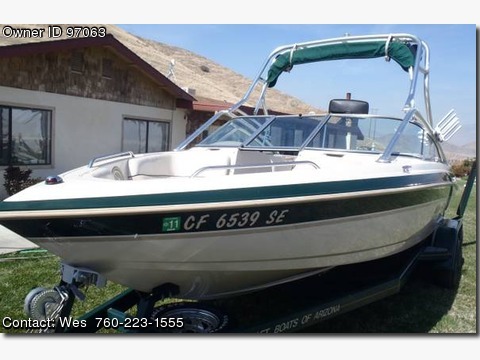 Please contact the owner directly @ 760-223-1555 or nosinnug@gmail.com..1999 MasterCraft MariStar 230 VRS. Boat is in great shape and ready for a summer of fun. Engine is the Indmar 350 Chevy LTR W/MPR, 330 H.P. Tandem Zieman trailer is Polo Green to match the boat. Has 400 hours on the engine. Uses dual battery system to insure a quick start every time. Is equipped with tower, wake board rack, teak wood platform. Clarion sound system with additional tower speakers. Has table for snack time and bimini shade for when the sun is too intense. Comes with extra prop, 4 Fat Sacks with pumps, ski ropes, life vests, skis, knee board and play tube.